In order to continue to sell quality products for the high-end wine market, the WineRackStore has chosen to omit traditional paper product markers and instead replace them with new gold labels affixed to each WineRackStore creation. The tags are duel purposed. Additional to making that transition into the next level of high end wine accessories, they also serve as a functional addition to help clients easily note where they can purchase extra products should they realizes they want another one, or have friends that may have inquired about getting one for their space. “By adding these tags, it makes it easier for current and potential customers to recognize and associate our products with our high standards of quality, it also serves as a reminder of where they can find more of what they want.” Said Admin Supervisor, Sidney Ray. The gold tags, measuring 1 inch wide and 4 1/2 inches long, displays the encryption “Proudly Made by WineRackStore.com ” and is attached to the cross piece of each rack, in the spot preference by each individual customer. 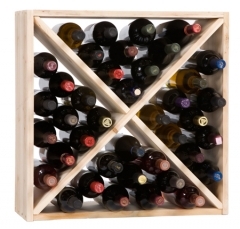 WineRackStore.com sells quality pre-made and custom built wine racks, cellars and wine accessories since 1995. WineRackStore.com is A+ rated from the Better Business Bureau. All products are locally crafted in Olympia, WA and are shipped free anywhere in the U.S.A.